Riviera on Vaal Hotel and Country Club is the perfect venue for adding a touch of “Magic and Style” to your wedding day. Tranquil, serene, picturesque and providing a natural but very romantic setting. 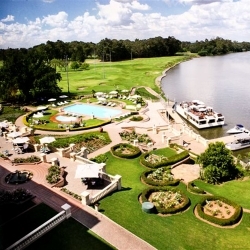 Removed from the hustle and bustle of Johannesburg on the banks of the Vaal River, the hotel is welcoming and depicts true elegance while cheerfully boasting first world facilities and services. Being situated on a unique bend of the scenic Vaal River and a quick 45 minutes drive from Johannesburg this hotel is ideal for any occasion. This luxurious resort caters for discerning business and leisure travellers alike. Whether you visit the hotel for a family getaway or for a conference, your needs will always be exceeded. This is one of few child friendly Vaal River resorts that have struck a perfect balance for family entertainment as well as business travel. Always ready to accommodate, amuse and entertain everyone with ample choices. The resort has 89 stylish and spacious rooms all featuring a unique angle of the Vaal River – where you can experience optimum quality, comfort and elegance during your leisure holidays. 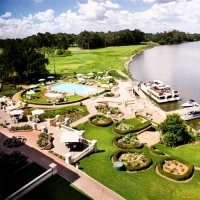 The accommodation packages include all the Vaal River resort’s entertainment offers ranging from golf and spa to delicious dining and pleasure cruises as well as water sports adventures. The hotel blends a comfortable stay seasoned with great activities that you will truly appreciate. The Riviera on Vaal Country Club has an impressive 18-hole golf course that’s both scenic and a challenge to tackle. Play a round of golf at a country club lining the Vaal River and offering a great time on the greens. Turn the game into a family, friend or corporate event, the course is adjustable to all golfers. A champion to ladies golf, the club is constantly seeking ways to advance the plight of women golfers. The Riviera on Vaal Hotel & Country Club excites your taste buds with its selection of restaurants in the Vaal - different flavours each with its own distinct style under one house. All the dining options here enjoy a prime Vaal River resort position, allowing you a glance of unique angles of the river view. Suited to almost any taste, the dining options available here will provide you with a memorable experience. Let the Riviera on Vaal Hotel & Country Club help you plan your corporate functions. Equipped with many resources, it is one of the Vaal River resorts that enable highly professional and successful business events. You are guaranteed corporate functions that will run smoothly ensuring your delegates are kept happy thus enabling you to focus on business matters. The hotel’s facilities, large selection of venues and amenities assure that you will have the right match for your corporate functions whether it’s a big production or just up close and personal.